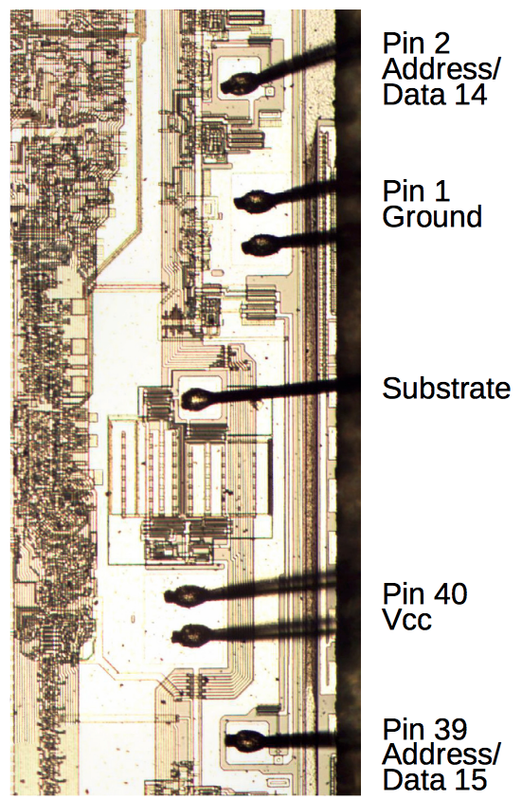 Looking inside the Intel 8087, an early floating point chip, I noticed an interesting feature on the die: the substrate bias generation circuit. In this article I explain how this circuit is implemented, using analog and digital circuitry to create a negative voltage. 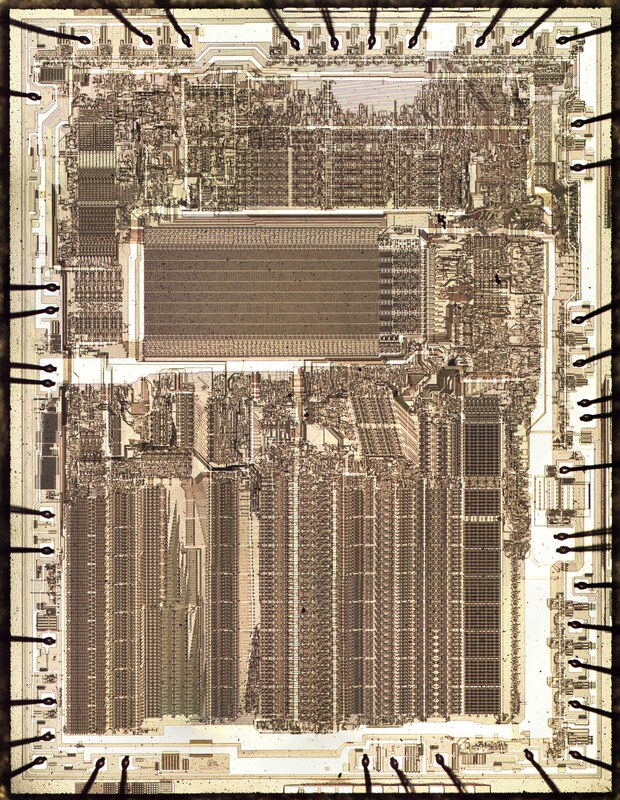 Die photo of the Intel 8087 floating point coprocessor chip. 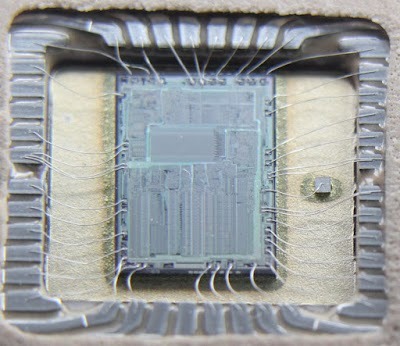 The black lines around the outside of the die photo are the tiny bond wires connecting the pads on the die to the 40 pins of the chip. 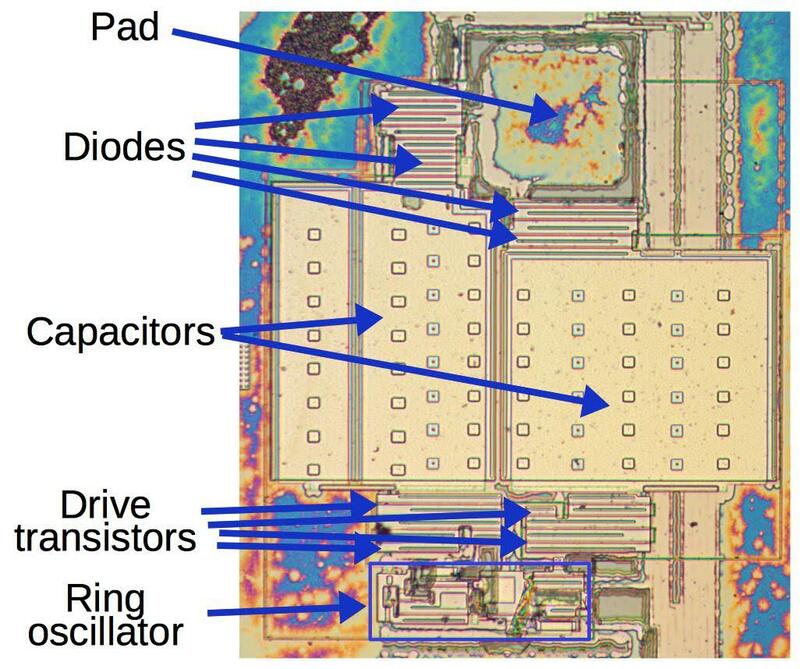 By studying the 8087 datasheet, it's not too hard to figure out which pad on the die corresponds to each pin of the chip; the chip's 40 pins (numbered counterclockwise) are wired in order to 40 pads on the chip. The diagram below zooms in on the center right part of the die, labeling some of the pads. (Note that the ground and +5V power (Vcc) pads have multiple wires in parallel to carry more current.) However, one puzzle appeared—an extra pad and wire located between pads 40 and 1, not associated with any of the chip's pins. 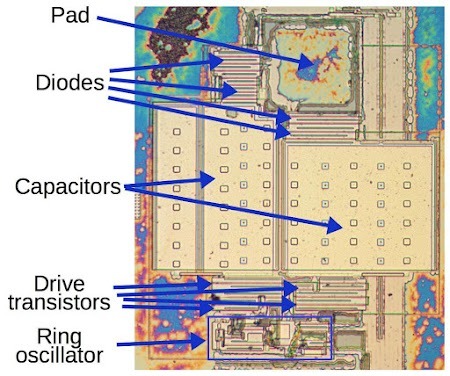 Each pad on the die of the 8087 FPU chip is wired to one of the 40 pins of the chip. But there is one extra wire between pins 1 and 40. It is connected to the chips's substrate. 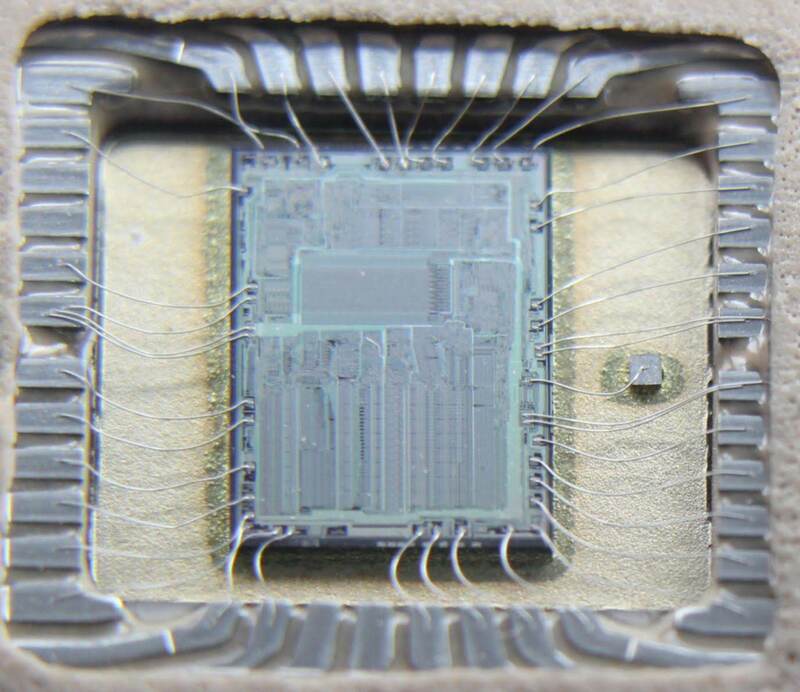 Looking at the bond wires on the chip (below) revealed that the mystery pad wasn't connected to one of the pins but to a tiny cubical block to the right of the die. Since the cube is on the same metallic base as the die, it connects to the die's underlying silicon, the substrate. I did some reverse-engineering and determined that this is part of the 8087's substrate bias circuit, which uses this connection to put a negative voltage on the substrate. The rest of this blog post explains how this circuit works. 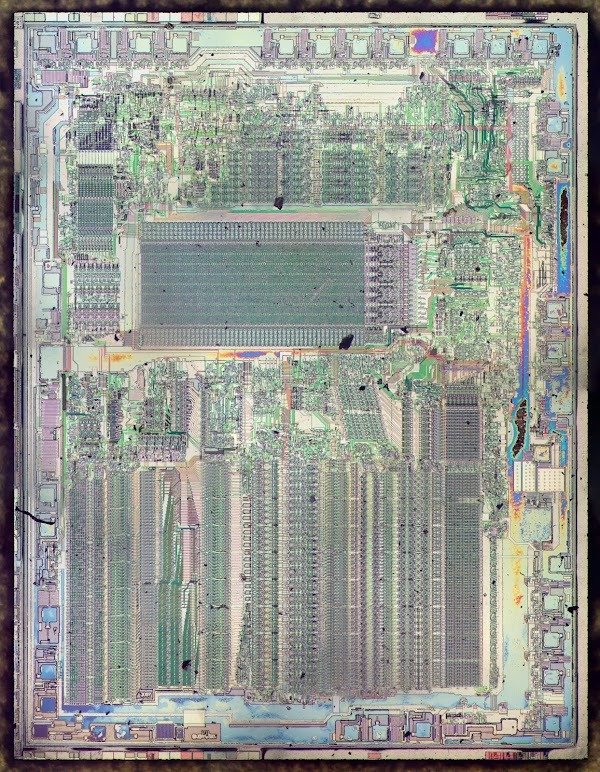 The die of the 8087 FPU chip, showing the bond wires from the die to the package. High-density integrated circuits in the 1970s were usually built from NMOS transistors. The diagram below shows the structure of an NMOS transistor. The integrated circuit starts with a silicon substrate, and transistors are built on this. Regions of the silicon are doped with impurities to create diffusion regions with desired properties. The transistor can be viewed as a switch, allowing current to flow between two diffusion regions called the source and drain. 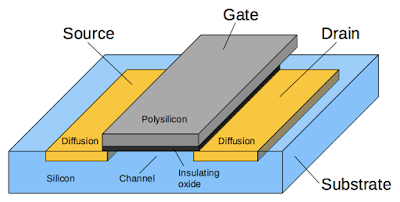 The transistor is controlled by the gate, made of a special type of silicon called polysilicon. A high signal voltage on the gate lets current flow between the source and drain, while a low signal voltage blocks current flow. An insulating oxide layer separates the gate from the silicon underneath; this insulating layer will be important later. These tiny transistors can be combined to form logic gates, the components of microprocessors and other digital chips. Structure of a MOSFET as implemented in an integrated circuit. For high-performance integrated circuits, it was beneficial to apply a negative "bias" voltage to the substrate. 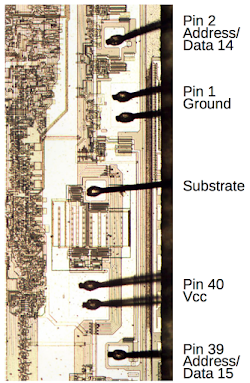 2 To obtain this substrate bias voltage, many chips in the 1970s had an external pin that was connected to -5V.3 However, engineers didn't like chips that required an inconvenient extra voltage. Even worse, chips of that era often required a third voltage,4 so systems required three power supplies to support these chips. In addition, the number of pins on ICs was limited (typically just 18 pins for memory chips), so using up two pins for extra voltages was unfortunate. Part of the solution, developed around the end of the 1970s, was for chips to generate the negative bias voltage internally. The result was chips that used a single convenient +5V supply, making engineers happier. You might wonder how a chip can turn a positive voltage into a negative voltage. The answer is a circuit called the charge pump, which uses capacitors to generate the desired voltage. The 8087's bias generator has two charge pumps working in alternation. The schematics below show the operation of one of the charge pumps. The charge pump is driven by an oscillating signal (Q) and its inverse (Q). In the first step, the upper transistor is switched on, causing the capacitor to charge to 5 volts with respect to ground. The second step is where the magic happens. The lower transistor turns on, connecting the high side of the capacitor to ground. Since the capacitor is still charged to 5 volts, the low side of the capacitor must now be at -5 volts, producing the desired negative voltage at the output. When the oscillator flips again, the upper transistor is turned on and the cycle repeats.5 The charge pump gets its name because it pumps charge from the output to ground. If you view the diodes as check valves, the charge pump is analogous to a manual water pump. Schematic of the charge pump used in the Intel 8087 to provide negative substrate bias. 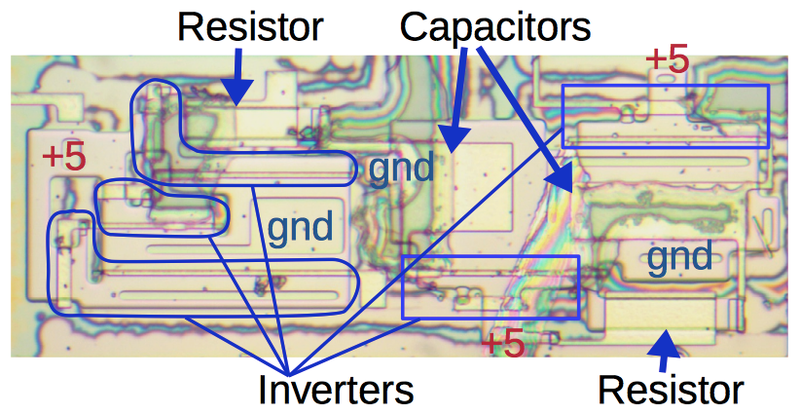 To reverse engineer the charge pump circuitry, I examined the die with a microscope. The metal layer obscures the transistors underneath, making it difficult to see the circuitry. 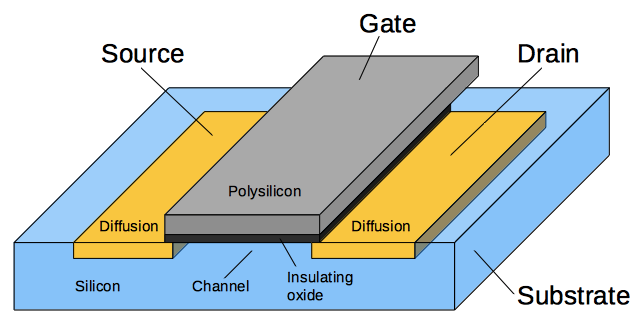 But by dissolving the metal layer with hydrochloric acid, I exposed the polysilicon and silicon layers, revealing the transistors and capacitors, as seen below. (The colorful regions are simply interference patterns due to some oxide that wasn't fully removed.) The die photo below shows the two charge pumps: one to the left of the pad, and one below. Each charge pump matches the schematic above, with two diodes, a large capacitor, and two drive transistors. The substrate bias circuit of the 8087. The metal layer has been removed in this die photo. The four drive transistors are much larger than regular transistors since they must handle high current. The red lines are the polysilicon wires forming the gates. The green lines are contacts to the metal layer, connecting the transistors to +5V or ground. The diodes next to the pad are formed from transistors by connecting the gate and drain together (details). The charge pumps are driven by the ring oscillator at the bottom of the above image. This ring oscillator consists of five inverters in a loop as shown below. Because the number of inverters is odd, the system is unstable and will oscillate. For instance, if the input to the first inverter is 0, the output from the fifth inverter will be 1. This will flip the first inverter, and the "flip" will travel through the loop causing oscillation. To slow down the oscillation rate, two resistor-capacitor networks are inserted into the ring. Since the capacitors will take some time to charge and discharge, the oscillations will be slowed, giving the charge pump time to operate. The ring oscillator circuit in the 8087's charge pump. Before explaining the ring oscillator, I'll show how a standard NMOS inverter is implemented in silicon. 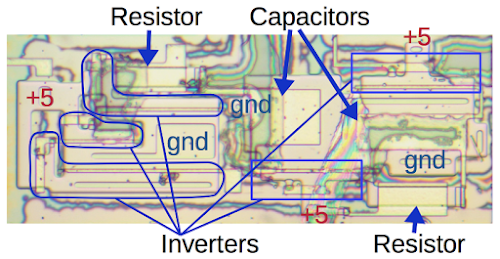 The diagram below shows an inverter, its schematic, and how it appears on the die. The inverter uses a transistor and a pull-up resistor (which is really a transistor). If the input is low, the transistor is off and the pull-up resistor pulls the output to +5V. If the input is high, the transistor is on, pulling the output to ground. Thus, the circuit inverts the input. 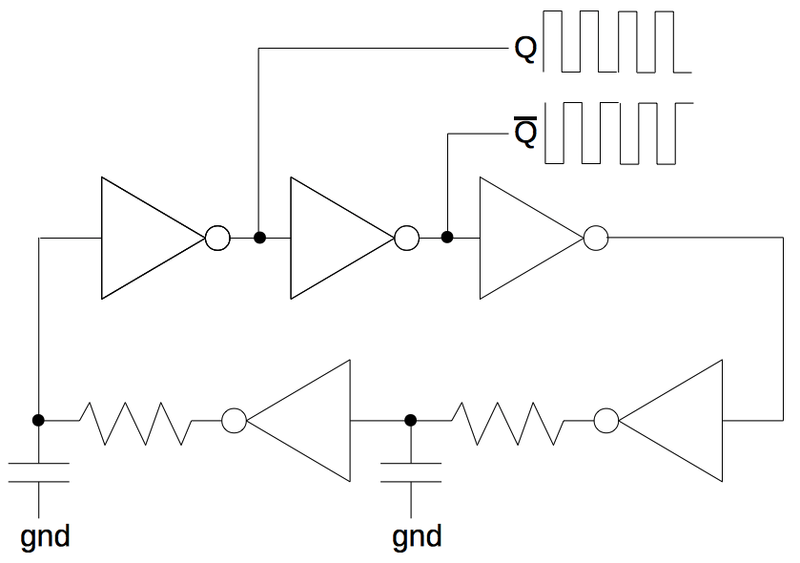 How an inverter is implemented with NMOS logic, and how it appears on the chip die. In the die photo above, the inverter's physical layout matches the schematic. The large beige regions are doped silicon. The thinner yellow areas bordered with purple are polysilicon. The input is a polysilicon wire. Where it crosses the doped silicon it forms the gate of a transistor between ground (below the input) and the output (above the input). The pull-up resistor is implemented with a transistor that has the gate and drain tied together; the indicated contact forms this connection between the transistor's polysilicon gate and its silicon drain. The polysilicon also forms the output wire. Thus, an inverter is implemented on the chip with two transistors. The ring oscillator in the 8087 FPU chip, as seen on the die. The photo above shows how the ring oscillator appears on the die. The five inverters are outlined. Each inverter has a different orientation to optimize the layout, but careful examination shows the same transistor and pull-up structure explained above. The resistors and capacitors for the R-C delays are also indicated. The resistors are simply transistors with a long distance between source and drain, reducing the current flow. These capacitors are constructed like the charge pump capacitors, but are much smaller; the silicon on the bottom and the polysilicon on top form the capacitor plates, separated by the thin insulating oxide layer. 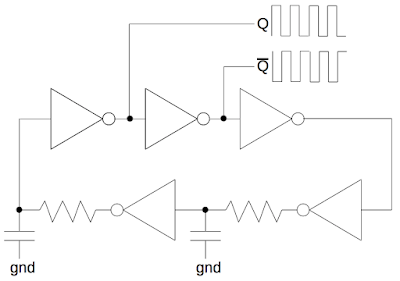 The substrate bias generator on the 8087 chip is an interesting combination of digital circuitry (a ring oscillator formed from inverters) and an analog charge pump. Substrate bias generator circuits were introduced in the late 1970s, helping memory chips and microprocessors to operate from a single +5V supply, much more convenient than requiring three different voltages. The substrate bias generator produces a negative voltage from the positive supply voltage by using a charge pump. Likewise, even though Intel's 8087 floating point unit chip was introduced 38 years ago, it still has a large impact today. It spawned the IEEE 754 floating point standard used for most modern floating point arithmetic, and the 8087's instructions remain a part of the x86 processors used in most computers. 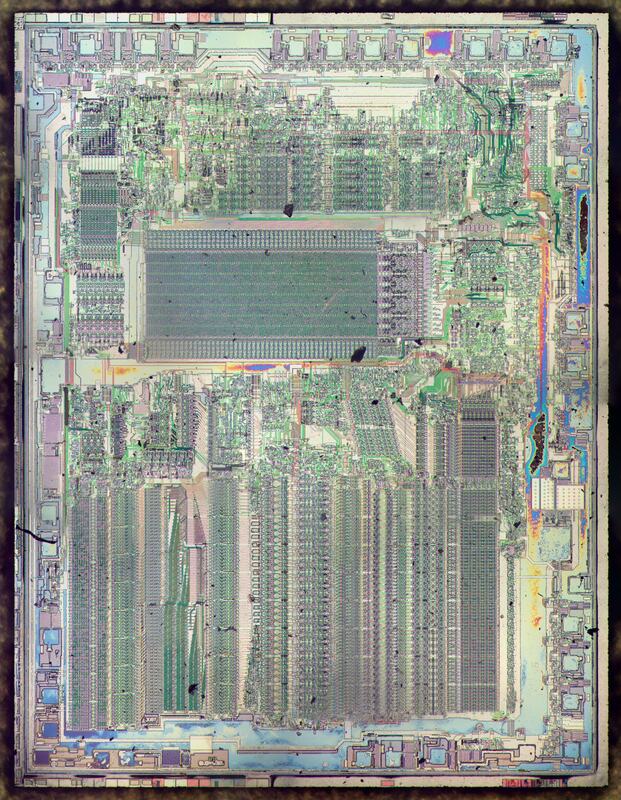 Die photo of the Intel 8087 floating point unit. The metal layer has been stripped off with acid, revealing the polysilicon and silicon underneath. I announce my latest blog posts on Twitter, so follow me at @kenshirriff for future 8087 articles. I also have an RSS feed. Thanks to Ed Spittles and Eric Smith for comments. The 8087 introduced a bunch of new instructions to the 8086, such as FADD (floating add), FDIV (floating divide) and FPTAN (tangent). These instructions were implemented using the 8086's ESC "escape" instruction, which was designed to let the 8086 processor interact with a coprocessor. Thanks again for another great post! Interesting fact, the x87 architecture including its limiting register scheme were the basis of x86's first generation vector computing. MMX (Multi-Media eXtensions) and AMD's 3DNow! both used the original register space. It wasn't until SSE (Streaming SIMD(Single Instruction Multiple Data)) Extensions in the early 2000s that modern x86 floating point and vector operations came about. x86 architecture is weird compared to RISC. That limiting register scheme I spoke of? The 8087 (and all newer variants) had a stack-based register system due to limitations. But you could "freely" swap two of the registers every cycle. All this mess makes me VERY thankful for modern languages and compilers. Ok that was a bit rambling. One other interesting thing I found is that next to the input pads (a bunch are in the lower left) are transistors with their gates grounded. These are gate-grounded NMOS ESD protection, which I also found on the chip I'm blogging about. According to Wikipedia, they are used in CMOS chips, these two chips though, are plain NMOS. Looking forward to your next post on the subject, or any other subject for that matter! Great to see the inside story on floating point. I've a penchant for the Am9511A, licenced to Intel and sold as the 8231A. It was the world's first arithmetic processor APU. I've quite a few working devices on hand, and would love to see the progression from Am9511A to 8087. If you're interested, I could send one/some for un-robing. Thank you for having this material. Thanks for mediating this technology. You make it very approachable. Nicely done. If my memory is correct, I recall that the 8087 was either required to run Autocad in the early 1980s, or was needed for reasonable performance. Autocad on your PC was light years ahead of alternatives in those days, you could make drawings on your own, mechanical, electronic schematics, etc. In the early days, PCs had no mice, so it was a million cursor key clicks to do anything in Autocad, but that was still an order of magnitude better than the other choices. Great article, especially the Mostek references, my first engineering job. I worked on the Z80, but I knew all the folks working on the MK4516 and other DRAMs. You didn't have a digitizer pad? No serious CAD workstation was complete without one back then. They were used as both an input device and as a means of quickly transferring dimensions off of blueprints. Anyone who did a lot of CAD work would have a macro sheet which contained their most commonly used commands; if the macros were set-up right you only had to point to the command on the macro sheet and click to activate it.